PayUMoney Facilitated 1 Billion Transactions & 1.3 Lakhs Sign Ups For Indian SMEs In The Online Marketplace! New Delhi, September 03, 2014: Since its inception in April 2013, PayUMoney has carved out a new market for Indian SMEs – with easy payment collection solutions and hassle-free integration, more than 1.3 lakhs SMEs have signed up with PayUMoney while 30,000 live merchants have already processed transactions worth 1 billion rupees! Achieving this feat in such a short span is nothing short of a revolution. How did PayUMoney pull off this task? By simply following the mantra – Whatever the payment collection need, PayUMoney has the payment solution to match! PayUMoney stepped in to erase the basic issues faced by Indian SMEs. Typically, a small business owner would first put in: Monies + Time + Energy + Build Website + Maintenance = End Product, i.e. an ecommerce website. This is a long and tiring process. But PayUMoney takes away all these steps and provides Indian sellers specific solutions for specific categories of business. Scaling up operation was the first step to success for PayUMoney! PayUMoney’s payment solution features are designed in a way such as to enable an average Indian seller to focus solely on his business as PayUMoney takes care of the payment requirements in a hassle-free manner! To achieve this seamless work-relationship, PayUMoney invested in a strong technology product with a solid scalable process to help lakhs of Indian sellers who were looking to increase their sales through online channel. This investment helped merchant acquisition and customer service teams to operate efficiently, enabling Indian sellers to adopt the online channel easily. But what makes PayUMoney different amongst the many ecommerce players who offer payment collection solutions to their SME partners? The below table showcases the average monthly transactions processed by live merchants on PayUMoney versus the average monthly transaction processed by traditional ecommerce players. This clearly indicates that using the PayUMoney has been more effective for SMEs to sell their big ticket products online when compared to ecommerce players as traditionally, ecommerce players act as aggregators, displaying products by other vendors as well. Using PayUMoney enables SMEs to not only market their products online directly but also collect payments for them. 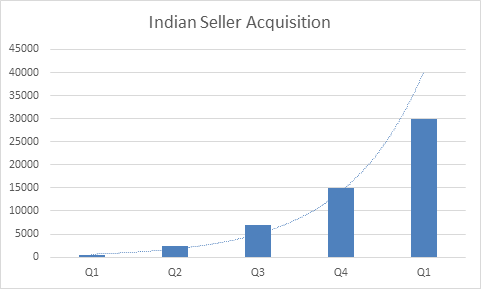 The above graph depicts the quarter on quarter growth for seller acquisition. In the 2ndquarter itself, merchants acquisition grew six times over, and the third, fourth and fifth quarter have seen acquisition double over each time, respectively. Offline businesses go online thanks to PayUMoney! PayUMoney has done what no other payment solution company in India has done, i.e. it has helped traditional businesses go online. In fact, approximately 20% of businesses being set up through PayUMoney are first time business owners having set up shop online. These first-time sellers have reported an average revenue increase of around 12% post adopting the PayUMoney payments platform. With over 213 million internet users in the country already, the internet reach is only set to increase exponentially. Additionally, according to IAMAI, large numbers of the Indian population is warming up to digital commerce due to the ease and trust built by the ecommerce players. This is great news for PayUMoney as the online payment solutions has already proven itself by providing SMEs and individual business owners a new marketplace to sell their products. By investing in a strong technological product with a solid scalable process the solution, PayUMoney helped lakhs of Indian sellers who were looking to increase their sales through online channel. This investment helped merchant acquisition and customer service teams to operate efficiently, enabling Indian sellers to adopt the online channel easily. d customer service teams to operate efficiently, enabling Indian sellers to adopt the online channel easily. Web PC Suite Android App Review: Access Your Smartphone on PC! 10 Paisa Per Minute Plans Launched by Aircel - Yet Another Industry First Proposition!